Here are some of my favorite recent pictures-these 2 are so fun! This skirt is one of the first things I bought when I found out we were expecting a girl-so excited it finally fits! Audrey loves grabbing her toes-which are painted pink! I'm not sure why it's taken me so long, but I'm finally posting about our quick trip to Vegas a couple weeks ago. We went down to be with family for the blessing of our newest nephew. Evan loved playing with 2 of his cousins and his Uncle Trae and my parents! We had a great trip and even though it took about a week, we've all recovered. Here's some pictures! 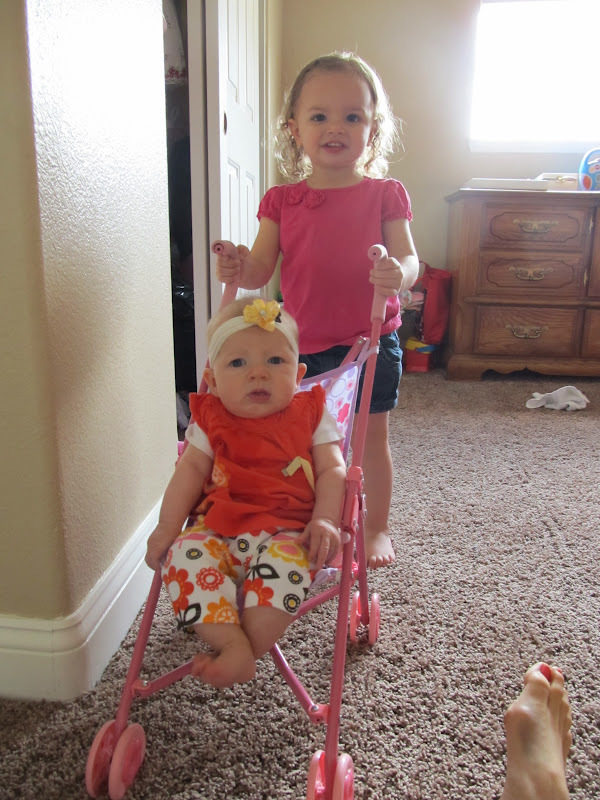 One of the kids' favorite activities was pushing Audrey around in the doll stroller. Audrey didn't mind it, despite the worried look on her face. These cute cousins had so much fun together. They got to go on a long walk with Grandpa. One of the best moments of the trip was when they all came back wearing leis with a bag of M&Ms in one hand and a pinwheel in the other! Little Miss Audrey got to try to pool out. She looked adorable, but the water was a little too cold for her liking. We ventured out one morning to go visit the new bridge at the Hoover Dam. It was pretty cool. Later that afternoon we spent a little time walking around the Strip. Evan really liked the fountains at the Bellagio. Personally, I prefer the real Bellagio in Italy! We had so much fun and were so glad we were able to visit with family. Thanks to everyone who fed us, housed us, and played with my kids! We'll have to do it again sometime!